Abstract: The paper describes a practical digitization project which was carried out by the Manuscripts Department and the Information Technology (IT) Department of the Romanian Academy Library (BAR) under the coordination of the Romanian Academy and with the support the Romanian Ministry of Culture. Mihai Eminescu is the greatest Romanian poet and his manuscript collection consists of 48 notebooks, over 14,000 folios, without a strict chronological order and related topics. Main objectives of the project were a) creating digital collections of Mihai Eminescu’s manuscripts in order to preserve the original and prepare a facsimile edition; b) allowing users to users through special collections available online for the research, publications on CD-ROM or DVD-ROM, and the WWW. Archival resources; digitized manuscripts; facsimile edition; IT platform; preservation. Gabriela DUMITRESCU, F. G. FILIP, Angela IONIŢĂ, Cornel LEPĂDATU, Open Source Eminescu’s Manuscripts: A Digitization Experiment, Studies in Informatics and Control, ISSN 1220-1766, vol. 19 (1), pp. 79-84, 2010. Mihai Eminescu (1850-1878) is Romania’s national poet (http://www.mihaieminescu.eu/). His literary manuscripts, correspondence and biographical notes are kept in the Romanian Academy Library (BAR; www.biblacad.ro): BAR holds several collections of a great interest (the collection of Mihai Eminescu’s literary manuscripts is one of them) which can not be displayed on the shelves to a large public because of their value and physical preservation reasons. Nowadays, with the development of new technologies, it is possible to allow access to this cultural heritage by substituting the original documents with high quality digitized reproductions allowing sharing the access to the information while protecting the original. 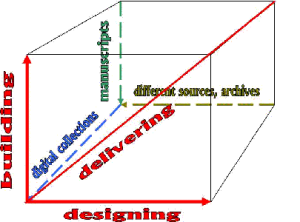 In this paper the term ‘open source’ will not be used as in the IT specialized language, but in a larger sense, in order to express the intention of ‘opening’ the treasure of the cultural resources for all the readers, at three different levels (Figure 1). The project is open because it allows building/creating the resources represented by digital collections of Mihai Eminescu’s manuscripts; it is also meant for designing a system of access easily to be used at different levels, from advanced scholars to university and high school students and the general ‘reader’; having a strategy for delivering. The project entitled ‘Mihai Eminescu – Manuscripts’ was carried out by The Romanian Academy Library and it was initiated and coordinated Acad. Eugen Simion, former president of the Academy, and supported by the Ministry of Culture. The remaining part of this article is organized as it follows according to several criteria. After some preliminary considerations the activities during the project are to be reviewed. Then several technical issues are presented such as preservation, formats, reproducing the text as an image and so on. The production of facsimile volumes is mentioned before the conclusions of the paper. CERQUIGLINI, B., J.-L. LEBRAVE, Philectre, An Interdisciplinary Research Project in Electronical Philology. Lili. Zeitschrift für Literatur-wissenschaft und Linguistik, vol. 27(106-171p. ), 1997, pp. 83-93. DUMITRESCU, G., Editorial Plan. The Eminescu’s manuscripts, Bucharest, Encyclopedica Publishing House, 2004, pp. 5-14. ExLibris ALEPH Integrated Library System http://www.exlibrisgroup.com/ category/Aleph consulted on 30.10.2009. FILIP F. G., Tehnologiile informatice si valorificarea patrimoniului cultural national. ACADEMICA Anul V, 9(69), 1996a, pp. 22-24 (in Romanian). FILIP, F.G., Information Technologies in Cultural Institutions. Studies in Informatics and Control, vol. 6(4), 1996b, pp. 385-400. FILIP, F. G., D. A. DONCIULESCU, Cr. I. FILIP, A Cybernetic Model of Computerisation of the Cultural Heritage. Computer J. of Moldova, vol. 9(2), 2001, pp. 101-112. KNOLL, A., Digitization of Rare Library Materials: Storage and Access to Data, Adolf Knoll et al. Prague, National Library: Albertina icome Praha, 1997. 1 CD-ROM (Memoriae Mundi Series Bohemica). 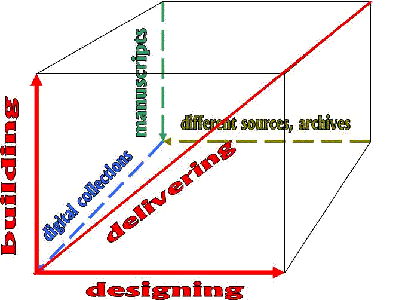 MAYER, T., A. KNOLL, Proposal of the Structure of Digitized Old Books and Manuscripts, Vers. 1.11. July, 1996. WARING, P., Edmund Barton Digitisation Project. http://www.nla.gov. au/nla/staffpaper/2001/waring1.html, consulted on 30. 10. 2009.